Consider this the first post in a new category I’ll call “Tech Dad Eric” for now. Monitors that use technology similar to a cordless phone (but with video) to connect to the camera. Monitors that use Wifi/home networks to connect to the camera. They each have their advantages. Option 1 establishes a very solid link between the camera and monitor, since the system uses its own dedicated wireless signal. These types of connections are not as finicky as wifi. 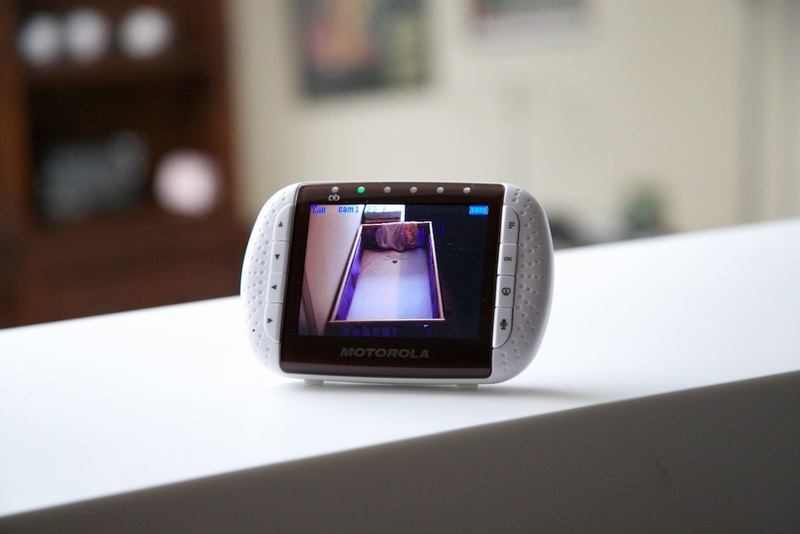 These monitors are easily kept turned on whenever you’re in a different room from your baby. The downside? There is no option to send the video signal to your smartphone or computer. You have to use the monitor that comes with the camera. Option 2, on the other hand, tend to come in packages with no actual monitor (i.e. the screen), just the camera. 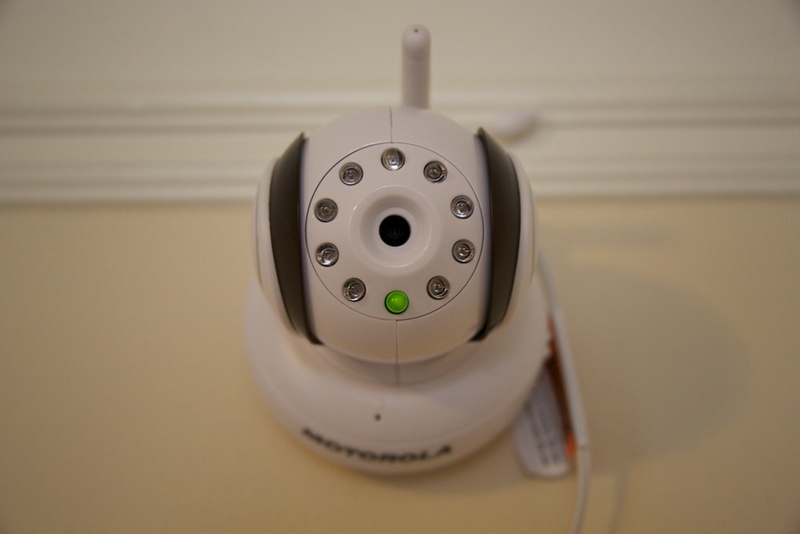 The camera plugs into your home network (or connects via wifi), where it transmits a signal that can be opened with a smartphone app or from a web page. Your iOS device, Android device, or computer is meant to be used as the monitor. The benefit of this kind of system is that you can (usually) access the signal even when you’re not home. You can be across the globe and see what your baby is up to (and I’m guessing there are many times when a parent will wish they were halfway across the globe). The downside? It’s more difficult to have an “always on” monitor. 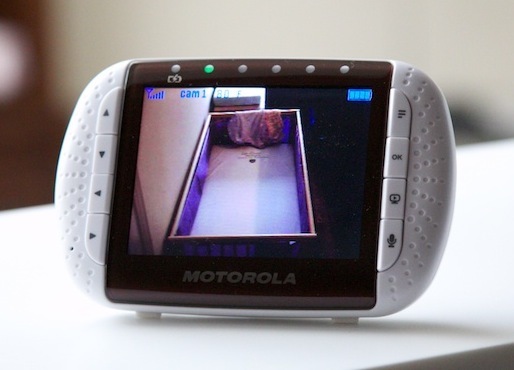 If your baby is asleep in the other room and you want to check on them without entering the room, you need to open an app or web browser. Part of me wishes it had more of a HAL 9000-like appearance… Though I can see where that might be a problem for some people. The Camera comes with a motorized base, allowing you to rotate and tilt it remotely. 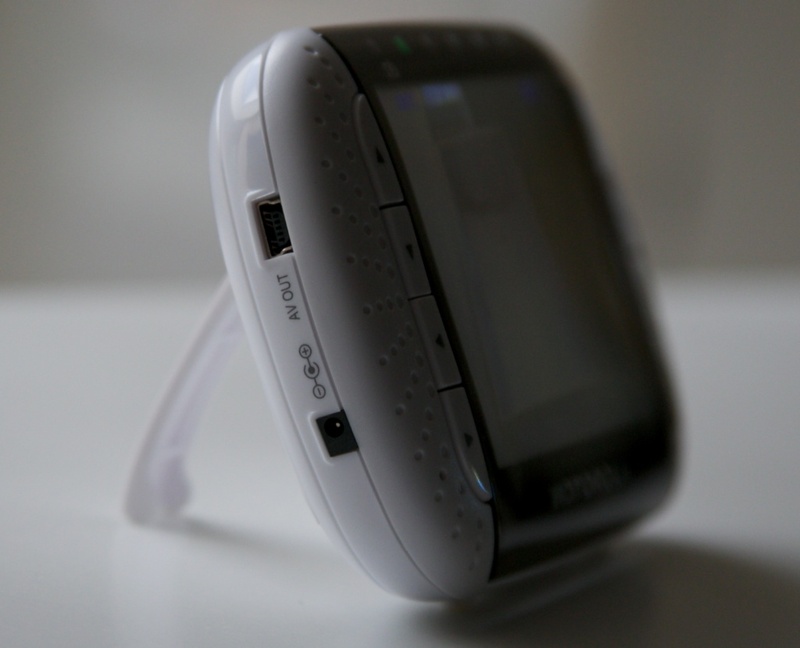 It also has a night vision mode and even a small speaker built-in that allows you to talk to anyone in the baby’s room (and play music, but more on that later). The closest flat surface to our crib with a good vantage point was a tall cabinet. We placed the monitor on top of the cabinet, thinking we could just aim it down into the crib, but the camera wasn’t able to tilt down enough. The good news is that the camera has a hook allowing it to be hung from a wall. We wound up just hanging it from a wall near (but not directly over) the crib. Very easy. It now as a “security camera”-like vantage point. We can rotate it around to get a good look at pretty much the entire room if need be. The 3.5 inch screen was plenty big. The screen shows signal strength, room temperature, and battery strength. The controls are very intuitive. The four arrows on the left of the screen, by default, control the direction of the camera. On the right hand side, the top-most button brings up the main on screen menu, which allows you to adjust the volume and brightness, the option to play music from the camera’s speaker, the ability to “zoom” in, the ability to switch cameras (if you have an optional multiple camera set-up), and the ability to set an alarm (for you, not the baby). The only features that were disappointing were the music feature (the sound is very mechanical) and the digital zoom (it has only one setting and it’s very pixelated). Fortunately, I didn’t buy it expecting to really use those features. 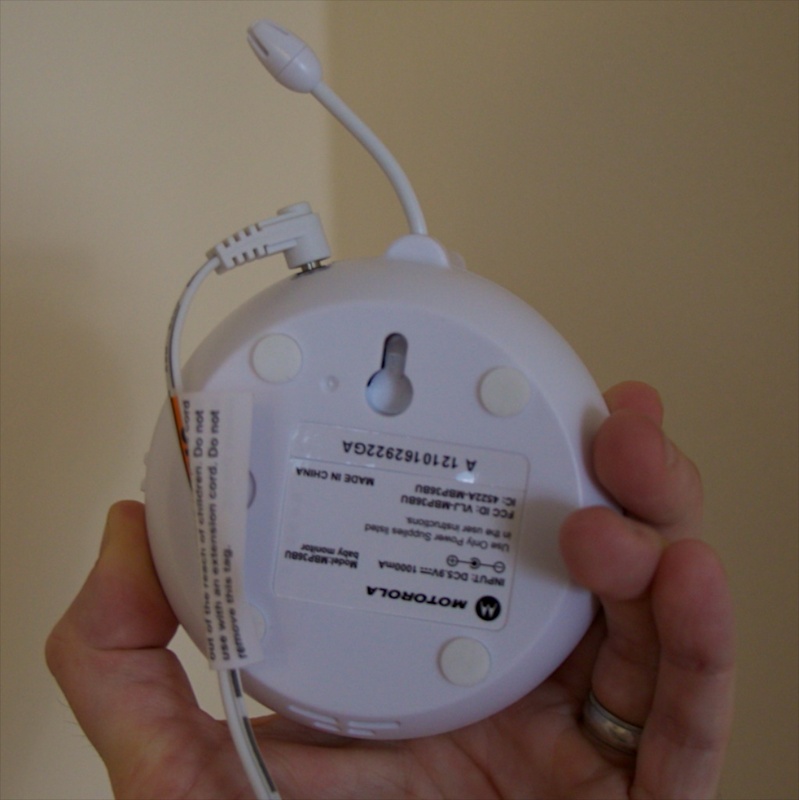 The monitor is battery powered, but not via normal batteries. It has its own proprietary battery. Before you use it, Motorola recommends you recharge the battery fully for about 16 hours. 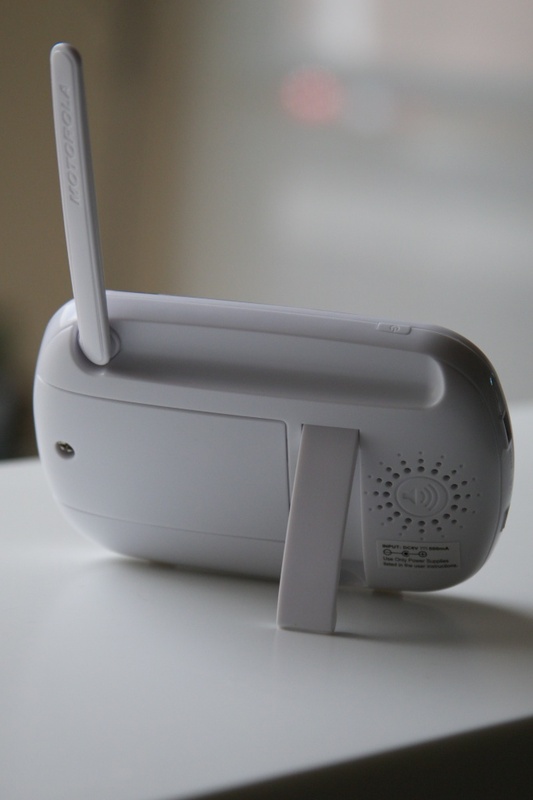 If the battery gets low, the monitor will notify you, and you can continue to use it while it recharges. Across the top of the screen, you’ll see 6 LED indicators. The one furthest to the left lets you know when its recharging. The rest are a visual indicator for audio, so you can visually see how much noise the baby is making by how many lights are lit up (even when the volume is turned down, or if you’re hearing is impaired). Along the side of the unit, you’ll see two ports. The lower is for the power adapter. The upper one is for an AV cable that will allow you to hook the monitor up to a TV set. The needed AV cable isn’t included, but it looks to be a mini-USB port which is somewhat common. A lot of devices (like camcorders, digital cameras, some smart phones, etc.) come with an A/V cable that uses such a port. So you might already have a cable that will work. I do not have one handy, though, so I’ll have to test this out later. On Amazon, Motorola-branded cables can be had for $10. The back of the monitor also has a kickstand and an antenna you can raise for a stronger signal, though I had no problem getting a signal throughout my entire house even with the antenna down (including spots of the house that are a dead zone for wifi). One feature I won’t be testing is the ability to work with multiple cameras (we don’t have a need for more than one). According to the documentation, though, you can connect it to multiple cameras and cycle through the various feeds. On Amazon, additional cameras sell for just under $100. And that’s the Motorola MPB36. It lists for $249.99, but you should be able to find it cheaper if you shop around. If you can live with a smaller screen and a few less features (like the ability to pan and tilt remotely), there are also 2.8 inch and 2.4 inch systems that retail for quite a bit less ($180 and $130 on Amazon at the moment).